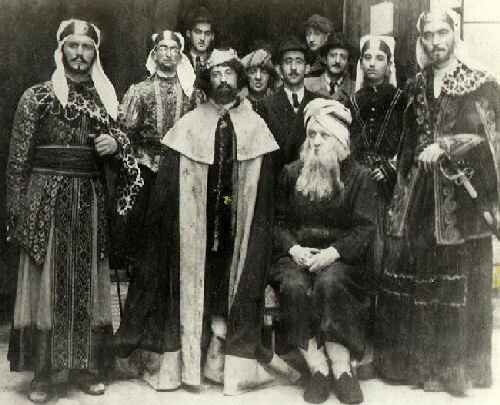 Seated right, with beard and striped headdress is Jeno Rosenthal, acting as Jacob. 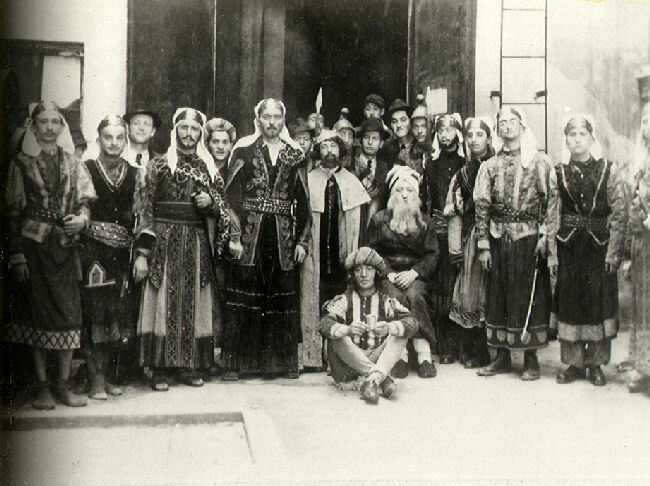 Standing on the far right is Bela Rosenthal, playing the part of Shimon. It is said that Yiddish theatre, written and performed for the most part by Jews, originated in the various traditional Purim plays. These satirical plays were generally derived from the biblical Book of Esther, though this particular Purim Shpiele, whose cast of characters is pictured below, had to do with Joseph being sold into slavery by his brothers to Ismael. Often, the subject of a Purim Shpiele was topical. These plays, usually performed by amateurs, were presented in various European countries in the eighteenth and nineteenth centuries. Often these plays were performed in synagogue courtyards and involved not just the cast members but some within the synagogue's congregation as well.